The surest option is to teach children in the form of a game. Knowledge associated with positive emotions will not evaporate in a couple of hours, and the child himself will tend to learn more and more. Modern technology of robots, thanks to which we have many interesting ways to learn and learn. This time we had a chance to test the smart little Ozobot robots. These electronic babies are programmed using special Ozo-codes. Their creator is the American company Evollve Inc. – In its development seeks to combine technology and social communication. So the sociable Ozobot came into being. It took two years for Evolve to develop the first small robot – from the idea to the launch of the market. Later, the improved Ozobot Bit was born, which you can program virtually and load the generated code into it. A little later, Ozobot Evo came out with a whole list of new features. Any Ozobot is compact and does not exceed 3 centimeters in diameter of its base. Model robots are only slightly different in height. Inside these robots, a lithium-polymer battery; they are charged through a wire with micro USB, and for the first time this process takes no more than 30-40 minutes. The charge lasts about an hour of continuous play. 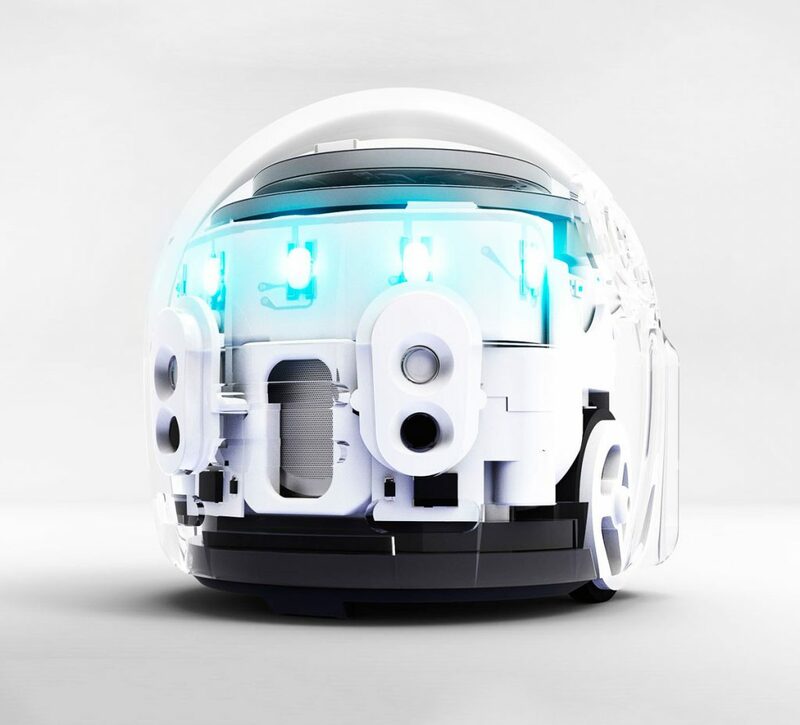 When meeting with any robot Ozobot draws attention to the transparent plastic case, through which it is easy to make out all the technical stuffing. Beyond the vision, two micro-motors and a friction transmission remain. At the bottom of the robots, the most interesting is the sensors, which distinguish colors, which, in turn, allows you to read the specified codes. Such a code can be drawn with handwritten markers, and the robot counts it simply by moving along the color line. Also, the movement pattern is created virtually, and then Ozobot loads it with a series of light signals. What it looks like in practice, how Bit and Evo are different, and indeed, what is so interesting about them – now we’ll tell and show. As the manufacturer claims, this is an option for children from 6 to 10 years old, who love robots and begin to learn them. There is no application for Bit as such, its role is performed by the OzoBlockly corporate website, which we will discuss in more detail when we get the robot out of the package. Honestly, when you open the box and start digging into it, your eyes run. Inside, in addition to the robot itself and the two clothes for it, there is a manual, caps and stickers, brand markers and charts that explain step by step how to program the Ozobot Bit. To start the robot you need to prepare it for the game, as it is written on the very first scheme with a large black circle. Familiarity with the robot will begin after you put it on this circle. We pay so much attention to it because it will need to be calibrated more than once, especially if Ozobot starts to behave strangely. So his brains are reset and come back to normal. Ozobot communicates using the language of colors, so you need black, red, green and blue markers. Different sequences of these colors transmit different commands to the robot’s brain. When passing through the color line, Ozobot reads the code and begins to execute commands, and the light bulb on his head is colored with the color in which he passes. The manual describes all the color codes with which you can program the robot. To apply them, it is enough to take a clean sheet of paper, draw a road on it and put the sheet on a flat surface. Well, after that we put Ozobot on the starting point, we give it literally a second to orient ourselves, and we see how it is worn briskly. Included, by the way, are ready-made maps and stickers with colored sections that are glued to these maps to create a route. The program for the robot can be written not only by hand. To create a virtual code, and there is already mentioned site ozoblockly.com – quite simple and understandable to use, so that problems with it should arise neither the child nor the parents. In any case, there is an instructional video on the site, in which the programming scheme is step by step analyzed. When the code is ready, the robot will need to calibrate and load the code into its memory. To do this, the robot needs to lean against the white circle on the screen of a computer or tablet, and a fast series of signals is transmitted to its brain. Ozobot Bit is available in two colors – white and blue. Also on sale is Ozobot Construction Set, additional accessories for the game worth a little less than a thousand. With the help of such a set, Ozobot turns into a miniature bulldozer and a real general of his little construction site. As we said, this is the next generation robot; It is designed for real engineers 8-14 years. And this is the case when the manufacturer has upgraded not only its product but everything that surrounds it. Packaging Evo looks like an organizer with retractable drawers. It is compact and will be convenient for storage in the nursery. The Ozobot Evo itself is slightly taller than its older brother. What is hard to miss is the sweet alien sounds that he begins to make when he turns it on. Improved Evo is equipped with speakers and additional light bulbs, and it becomes more interesting to communicate with it. Included with the robot is a bag for carrying it. Evo, like Bit, is easily programmable using drawn color codes, so if you have markers and white paper, you can take both on a journey and even arrange a race between them. To lead several Ozobot at once or to invite friends and their robots more often. Unlike our first hero, Evo has its own application with which you can fully control the robot. Communication is via Bluetooth. When you first start you will be asked to register: you can skip this item, but then you will not be able to access some features of the program. The first step we turn on Bluetooth, the second – the robot itself, in conclusion, Evo will light up to show that the connection was successful. After that, you can do almost anything with a robot! In the main menu, select the Play item and, for example, try to steer the Ozobot using the joystick that appears on the screen of the smartphone after we press Drive. It is necessary to get used to the control of the Evo with the help of a joystick, it is very smart small. The speed of its movements, by the way, can be changed through the application, as well as the modes of illumination of its light bulbs – each of them is turned on and off separately. In addition, we are given the opportunity to choose a favorite color, and the robot immediately begins to emit it. In addition, there are several interesting features in the application: for example, a page with achievements to which the child will strive with his robot, or a game where Ozobot acts as a “projectile”, which should be launched into colored circles. You can play alone or with friends. Speaking of friends. The app for Ozobot Evo allows you to add new friends and chat with them in a special OzoChat. Moreover, you can even remotely ask your friend’s Ozobot to show some of your emotion. It’s like sending a video Emoji, only it’s called Ozoji. Programming is also available for Evo via the OzoBlockly website. The code created there is sent to the application, from where it is then stored in the memory of the robot. It is a pity, of course, that you cannot program directly in the application, but in any case, it is more convenient to do it on a computer. Stylish Ozobot Evo comes in white and black colors. Additionally, you can order the costumes of the heroes of the Marvel universe. During testing, we found that in addition to the classic application for Ozobot, there is the OzoGroove program. It is better to download it immediately to the tablet. OzoGroove is a virtual dance floor for Ozobot robots. Yes, this disco dance floor with clockwork melodies and ready-made schemes of dance movements. The tablet is placed on the table, Ozobot is placed on a special circle on the screen and calibrated. Then a dance code is loaded into it using light signals. When this bright extravaganza ends, you can turn on the music and start the robot to dance. It looks especially good if you dress up in some costume with a hat or a wig. And this is again the case when it is more interesting to play with several Ozobot at once, so call your friends to a dance party, it will be fun! If you think your fidget needs a more active or overall toy, take a look at the Sphero BB-8 Droid robot. The alternative is not bad, especially for fans of the Star Wars saga – this robot ball looks exactly like its prototype from the seventh episode. Communication with the Droid requires a smartphone and a proprietary application – without this, the robot becomes an element of the home interior. Its device is externally elementary: a small ball with a floating head on a magnet. And although it is quite small, it is still quite noticeably larger than any Ozobot. BB-8 and Ozobot Evo have a lot in common. Operated by a droid with a joystick on the screen; it changes the speed and makes sounds, though not itself, but through the dynamics of the smartphone. But BB-8 directly responds to voice commands and can demonstrate a dance movement. 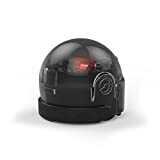 Another interesting feature is the patrol mode, during which the Robo-ball collects information. Also on sale is a special edition with a bracelet for management, thanks to which the need for a smartphone disappears. If you still see a future engineer in your child, then one of the Ubtech designers can be a good gift. They vary greatly in degree of difficulty and, accordingly, in the price tag. Among the options for such designers are animals, cars, an anthropomorphic transforming robot, a space explorer. Most importantly, all these kits provide ample opportunities for creativity. The child can assemble the robot according to the instructions or come up with his own, and this invention will still work. The movements of the robot designer are programmed using the application. Although we have long been out of childhood, we admit, we enjoyed working with Ozobot very much. The impression was made by a transparent robot head, which allows you to see its inner world – tiny chips and chips in all its glory. Plus, such an intelligent toy has at least one indisputable advantage – it takes up very little space, it is convenient to store it (every mother will now remember these endless boxes of toys in the nursery). Given the number of different color teams and their combinations, any Ozobot will become a favorite toy for a child for a long time. If you have decided to choose a friend from the Ozobot family, then make a start, first of all, from the age of the child and his experience of acquaintance with such toys. Ozobot Bit is a great start for a young programmer, and let him be inferior in terms of the number of functions to his youngest, Evo, and he has enough ideas for fun. Evo, of course, impresses with its sociability and bright LEDs, the application developed for it is thought out to the smallest detail. Such a toy is suitable for an older child, who already probably has his own smartphone. If you still doubt your choice and want to look at other options, we suggest that you look for other robots, drones, cars, helicopters and other interesting things for children on our website.